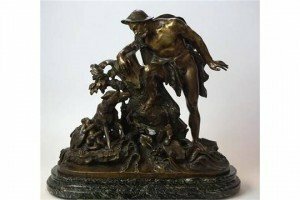 French bronze figural group, late 19th Century, Depicting Faustulus discovering Romulus and Remus with the she wolf, the semi clad shepherd leaning across a tree stump, the she wolf suckling a child with the other beside her, raised on a naturalistic marble base. 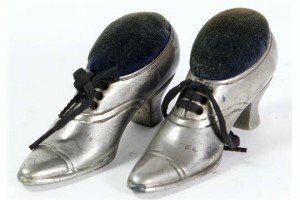 A pair of 20th Century cast metal or pewter novelty pin cushions, each in the form of a Victorian ladies heeled shoe, with applied and tied laces and plush mount. 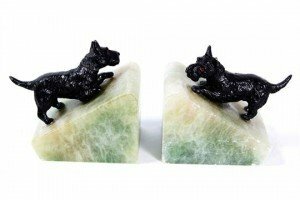 A pair of Art Deco figural dog bookends, each of simulated green onyx triangular form adorned with a cast metal and black painted model of a Scottie dog. 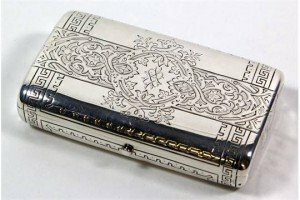 A Russian silver cigarette box of rectangular rounded form, engraved to the exterior sides with key fret borders and Arabesque style scrolling designs, encircling a central cartouche with monogram, further detailed with star and Russian inscribed text throughout. 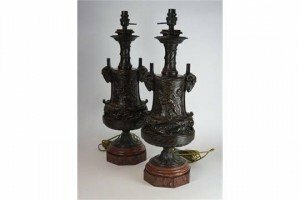 A pair of bronze 19th century lamps, the vase surmounted by spiralling turned necks, flanked by rams mask mounts, bodies cast in shallow relief with frolicking naked putti, each with a further row of four putti below, the putti lifting up drapery to reveal the indented section raised on foliate cast socles above rouge bases, complete with matching bronze shade holding brackets. 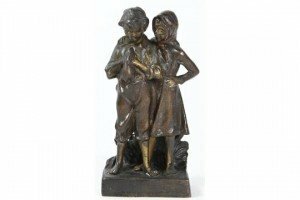 A 20th Century cold painted and patinated bronze figure of a boy and a girl Cast modelled on a raised plinth base, depicting the boy and girl dressed in rustic clothing, the boy holding a small rabbit. 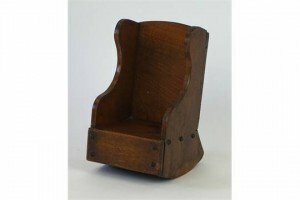 An early 20th Century carved wooden apprentice rocking chair, the carved wooden sides, seat and back applied with metal studding. 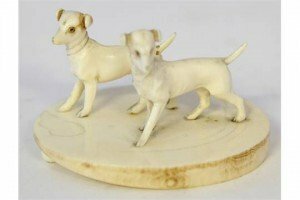 A Continental carved ivory figure group of two dogs, possibly German, mounted on a carved ivory plinth base, the two small carved ivory terriers modelled in alert standing position. 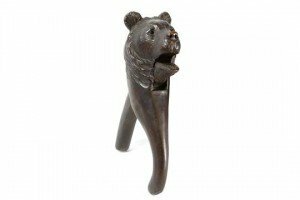 An early 20th Century carved Black Forest type nutcracker, in the form of a black bears head extending to lever handles, applied with black glass eyes. 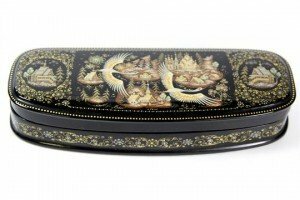 A Russian papier-mâché box, of rounded rectangular form raised on a folded foot rim, the hinged cover revealing red painted interior, the exterior cover painted with woodland scenes of rustic houses, set within scrolling tendril borders, further painted with crane in flight and rural building within forest and foliate settings, all within a gilt dot border. 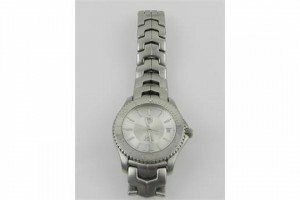 A Tag Heuer Geneva gentleman’s stainless steel link wristwatch, having a uni-directional time elapse bezel, the dial with date aperture, set quartz movement. 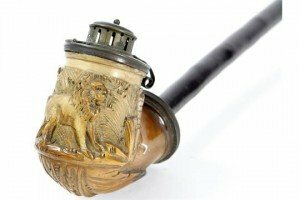 A Middle Eastern hookah type pipe, the carved and turned pipe section extending to a carved bowl with lion and foliate landscape designs, surmounted by a cast metal cover with pierced gallery and top. 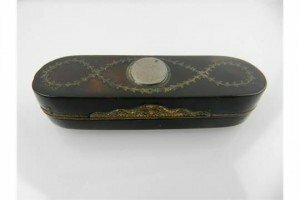 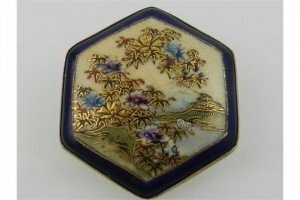 A George III tortoiseshell and silver inlaid patch box, inlaid vacant cartouche with in tendrils inlaid vacant design, with blue fabric interior. 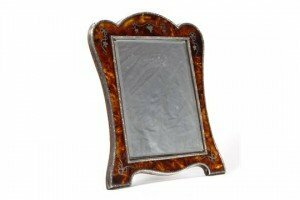 An early 20th Century silver mounted and tortoiseshell easel mirror, the bevelled rectangular mirror plate set within a scalloped inlaid tortoiseshell frame, with reeded inner and outer slip frame, applied with inlaid silver floral swags resting on an easel back, silver hallmarked Birmingham 1909.